The Siege of Pensacola pits a numerically large but fragile Spanish army, supported by a small corps of French allies against a smaller, feistier British army enjoying strong fortifications and highly mobile Indian allies.As the Spanish player you will need to determine where you will build your siege gun redoubts and will then have to protect your soldiers from raiding British units to finish the works in time to mount an effective bombardment.As the British player, you have far fewer forces, but armed with special raiding rules, your Regulars, Tories and Indian allies must harass and erode Spanish morale, while delaying the construction of Spanish siege works for as long as possible in the hope of keeping your three forts intact to face the coming coup de main. The game begins with Don Bernardo de Galvez’s army of 5,000 having just landed on the mainland.How many forces actually are present is decided in a special phase during the initial set-up wherein that portion of the Spanish army that sailed from Havana must run the gauntlet of the Red Cliffs Fort guns.Hence, the starting forces for Spain are likely to be different for each game played as units and leaders are eliminated or delayed in their arrival.Once these forces are ashore, the Spanish player faces some hard choices.Does he send forces to take out the Red Cliffs Fort, to protect his turn 7 Spanish and French reinforcements from having to run the same gauntlet, or does the Spanish player immediately begin construction of the siege works, to achieve the longest possible bombardment before the coup de main? The British player is outnumbered, but must employ his small forces in aggressive and often risky raids to slow down siege construction, wear down Spanish morale and worry the Spanish lines of supply.Getting a small force into one of two Spanish stockades can be devastating for the Spanish.Thus, though numerically superior, the Spanish player has much to do and protect, and will often be spread thin by a well-conceived series of raids.Giving the Spanish too many siege turns to bombard your three forts and/or permitting the Spanish to launch the coup de main with high army morale is likely to spell disaster for the British player. 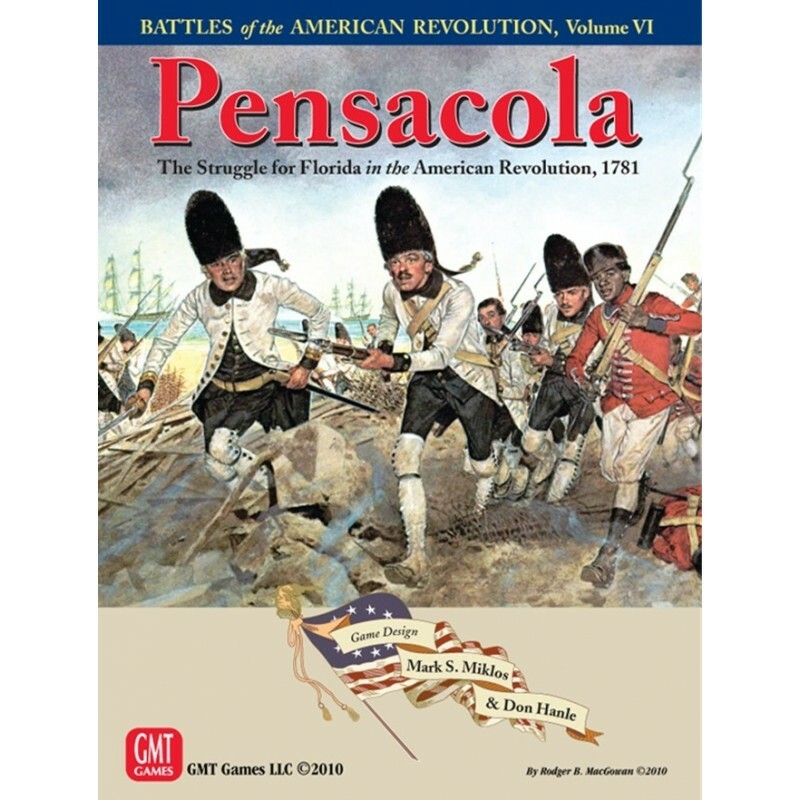 Pensacola 1781 thus joins Savannah as the second great siege game in GMT’s Battles of the American Revolution series. As with Savannah, Pensacola, 1781 employs 55 historical event and tactics cards that compel both players to face the same concerns of the commanders of each side. The game includes new terrain – Palmetto hexes – which are essentially light woods, which do not block LOS and in which only Indians and Light Infantry have ZOCs.It also introduces Raiding Rules which permit the British player to emulate the multiple harassing raids the Spanish experienced during the siege.Indians are also now able to perform “Indian Withdrawal” making a Spanish pursuit much more difficult and risky.But raids are by no means a sure thing for the British player, and having raiders out when the Spanish player declares a coup de main may spell disaster. Other rules include making it possible for the French to desert their Spanish allies if Spanish army morale falls too low.Special siege bombardment rules now permit the Spanish player to select the precise fort hex side they are firing at, giving a greater deal of control over the bombardment than in earlier siege games.The key to a successful bombardment depends upon how early you begin and where you locate your siege gun redoubts . . . and whether or not you can protect them from British raiders.